Google+ Hangouts has been used by many celebrities, Politicians and noted personalities to interact with common citizens. From US President Barack Obama to Shri Shri Ravishankarji, all of them have at one or other time used Google+ Hangouts. 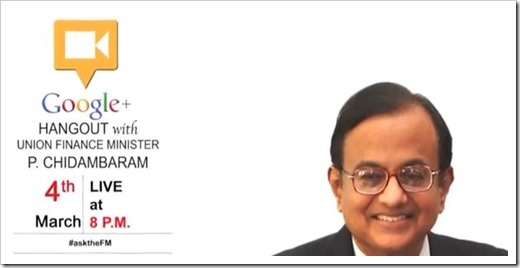 Now, we will have India’s Union Finance Minister Mr. P Chidambaram who will be taking questions straight from Indian citizens using hangout on Union Budget. He will respond to citizens’ questions, and discuss the state of the Indian economy with a panel of industry leaders as well as citizens. As Google+ hangouts has limit of 10 people at a time, all of them may not be able to participate, but everyone can watch the live hangout, when it is happening on Youtube. If you want India’s FM to answer your question, go to your Google+ account and ask your question by using #asktheFM hashtag. In addition to asking the question on Google+ using #askthefm hashtag, users can also submit their question in the form of a video by going to In conversation Youtube Channel. coming on Hangout doesn’t matter a lot, the thing which matters is a good budget !! Resp, Sir , I think budget is not at all requried if you and congress party will recover the scam money such as kalmadi(sports), raja(telcom),mining, helicopter (aveation) ,& black money from big business as you them. i can request you please save the nation on humanity basies not on political basises. make our nation healthy. india is having lot of money , but no proper utilization richer is becoming richer & poor is becoming poor and poor. But persion from middle class is suffering.